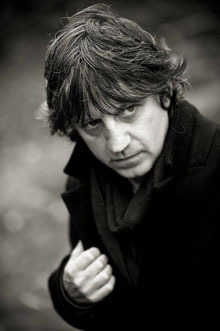 Bap Kennedy had experienced tough times and lived through an awful era in Belfast. It was not cool to show your feelings so much then. Many people chose to be gruff and inward-facing and there was an aspect of that with Bap. This was compounded by the fact that he was involved in the music industry, where the game face and the shtick were expected. That wasn’t his way. So he may have seemed awkward at times. Back in the ’80s he sometimes joked on stage, clowning his way though the preacher routine on ‘Pain Heartache And Redemption’. That was less common. His default was tenderness. That’s when he left the restraints of place and circumstance and instead he was lit with grace. He loved Hank Williams, “the Hillbilly Shakespeare”. It was about simple words, powerfully wrought. It involved the authentic crack in the voice, the microtone that revealed a whole universe of misfortune. As he moved from his early adventures with Ten Past Seven, across to London and then Energy Orchard, he found an artistic character, his version of the Hank method. For a time, Energy Orchard had a residency at the New Pegasus in north London. The band was working up the first album and getting noticed by the likes of Steve Earle, who helped to get them their MCA deal via his partner Teresa Esenat. It was a time of high emigration and those gigs were full of lost-looking Irish people finding solace in Bap’s singing. That’s what ‘Sailortown’ was about – the fading prospects and the lonesome call of the waterway. And on the Joby Fox song ‘Belfast’ he laid out all the ambivalence of a town that commands your affections but also cleaves your heart. One of the common bonds back then was ‘Astral Weeks’ by Van Morrison. It was about the homesick blues, taken to a transcendental level. Bap was in awe of the album and listened to it constantly. In return, Van recognised the worth in this newcomer and so Energy Orchard supported the man live and Bap played harmonica with Morrison – to his utter delight. You would sometimes see Bap on the town with Steve Earle and it looked simpatico and messy. But their friendship endured and Steve helped his friend into a solo career when the band had expired. Bap also frequented Filthy McNasty’s in Islington, home to Shane MacGowan. The latter lent his vocals to the Bap song, ‘On The Mighty Ocean Alcohol’. The horrors, quietly remembered. Just as Van imagined the universal in east Belfast, so Bap was lyrical about his own haunts – Slieveban Drive in Andersonstown and Beechmount on the Falls. He used the license of his imagination and an old photo to evoke ‘Shimnavale’ – about the sweetest girl in the Mournes and the wrench of being somewhere else. Mark Knopfler was producing, another musician-fan. Bap lauded the Chilean miner Jimmy Sanchez and on ‘Please Return To Jesus’, the sailor’s tattoo indicated his direction home. He found a surprise audience on the soundtrack to Serendipity. In the big scene, John Cusack is smitten by Kate Beckinsale – strangers on the icerink and a tremendous coup de foudre. Bap sings ‘Moonlight Kiss’ and all is amazing. According to Bap, the film’s director Peter Chelsom had been in a café when his album ‘Lonely Street’ album had been playing, and the track presented itself, just so. Bap often reminded me of the Dustin Hoffman character in Midnight Cowboy. He was Ratzo Rizzo, living off his street smarts, unkempt and unholy. Yet also blessed with the greatest smile and a romantic nature that would not be daunted by bad times. Ratzo didn’t quite make it to Florida, but he got close, and the soul he invested en route made him victorious. Bap Kennedy was heroic in his final months. He faced up to mortality with honesty and even humour. He was able to finish preparations for another album and he took joy in the fact that people were sharing his music online – old and new – and putting out their love for him at the same time. He had a soulmate in Brenda. They created music as a pair and became a powerful complement. More recently, he wrote about his late diagnosis of Asperger Syndrome and how an appreciation of this had allowed him to think differently about his personality and his art. The singer that had once been inward-facing, wry and unsure had opened up, completely.